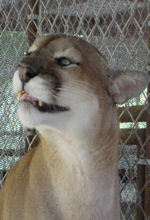 We rescued Keenan from private owners who were looking to place their 5 cougars and a tiger in a good home. The owners have been in contact with us for 3 years hoping we would have room for their cats since they had a desire to move out of state. Unfortunately, the only facility that could help us wanted only one male and one female cougar, and we didn’t have the heart to break up the group of cougars who been together since Keenan and his littermates were born. Keenan accepted us from the start. He’s very affectionate and purrs constantly. He’s definitely won the hearts of the volunteers. Like his brother, Charlie, Keenan’s front teeth are worn down, probably from chewing at a fence, however, this does not prevent him from enjoying his meals and treats. He often give Mercedes silly, toothless grins. 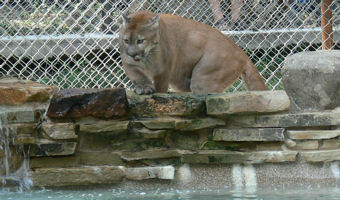 Keenan’s nickname is “Keenan the Explorer” since he has investigated every platform in his enclosure.